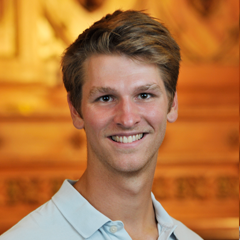 Tyler grew up in Southern New Hampshire and moved to Chicago to study at Moody Bible Institute in the Fall of 2010. He started attending Covenant during his time at Moody and decided to stay at Covenant upon graduation. Tyler began working at Covenant as the Seminary Intern in May 2014 and began his Masters of Divinity at Trinity Evangelical Divinity School the following fall. In August of 2015, he became the Director of Youth Ministry at Covenant. After graduating from seminary in May of 2017 and upon finishing his denominational exams, Tyler was ordained as an Assistant Pastor in February of 2018. Tyler married his 7th grade date to the Valentine’s Day Dance in March of 2018. He and his wife, Grace, live in Wicker Park and in his free time you can find him either running, cycling, swimming, or supporting New England sports teams. Tyler spends the majority of his time with the youth and children of the Church, leading Sunday School, small groups, and special events for students in 6th-12th grade. He also spends time writing curriculum, teaching and meeting with students and supervising Covenant’s AWANA program: a weekly bible club for kids.